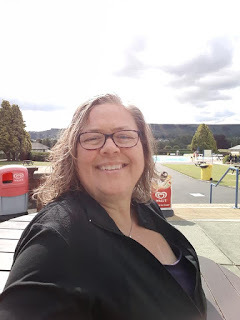 I’ve used a quote from the Hitchhikers Guide to the Galaxy - been re-watching it recently - to title this blogpost but it is really about my lovely trip to Ilkley yesterday. I sometimes can’t believe the places I trot off to on my own. It’s often writing that takes me to them. Or music. In this case, it’s my love of swimming. It was in my New Year’s Resolution blogpost about wanting to swim in Ilkley Lido so I decided this was the day. Not very warm but sunny, cloudy, no rain. The three & a quarter hour journey ended up being four hours. 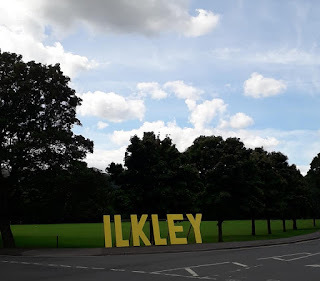 I was due to change trains at Shipley but when I alighted I discovered there was a fire on the tracks so my next train was cancelled and, there being no toilets in Shipley station, I jumped on a train to Leeds, unsure if I would get to Ilkley this way. My geography of Yorkshire is hazy, google maps not playing ball to help me out. I’d read some truly dreadful reviews of Ilkley Lido on Trip Adviser the previous evening. I only looked to find out if they have lockers because if you go somewhere on our own you don’t have anyone to mind your stuff while you take a dip. I had last minute panics about being stranded in Yorkshire in nothing but a damp swim dress. No money, train ticket, keys, phone, clothes, not even my glasses. I would be helpless. Scary thought. Of course they have lockers but I got involved in reading all kinds of reviews about how unclean and tatty the place was. Awful café, staff that just chatted, thieves and drinking ‘chavs’, a need for flip flops in the tiny changing rooms/toilets as the floor was covered in piss and worse. They made it sound horrible. Dark, damp, evil-smelling and dangerous. But it was fine. Slightly worse for wear being an old pool and buildings but seemed pretty clean, well-organised, lots of staff. I can see how things might get a bit unpleasant in hot weather when it’s very busy but that’s to be expected. As someone on TA pointed out, this is council run not a private health club. Let’s face it, they’ve done well to keep it open all this time. Morecambe’s pool is long gone. There is a campaign to save the lido at Grange-Over-Sands, which is disused. As always this is about money. 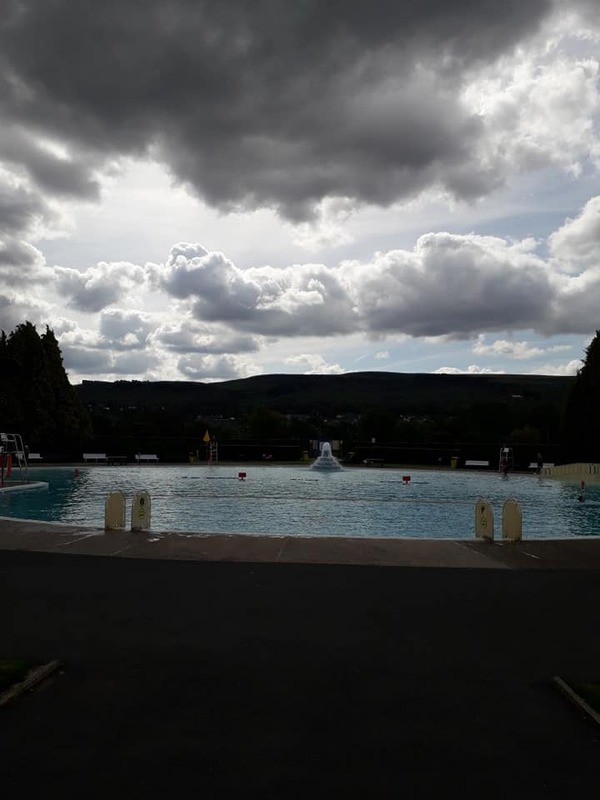 Ilkley lido is in the shape of mushroom. The stalk is the deep end at 2m, the widest part is 1.5 & the top mushroom third is the shallow end with a slide and fountain, the children’s area. I got in the middle section and was immediately plunged up to the neck into bracingly icy COLD water, which almost took my breath away. GASP! Colder than Gurnall Dubbs tarn of a few weeks back, I'm sure. Lovely though. I just got swimming, trying to breathe at the same time. Always a good idea. After a few of the longer lengths I joined a pair of older-than-me women in rubber bathing caps in the mushroom stalk. (I'm looking at that and thinking 'mushrooms talk ... ha!) I climbed out into the relative warmth and got back in, deciding against swimming under the rope-with-floats dividing the two sections. Far too cold to dip my head in. After a few lengths one of the women got out and the other was talking to one of the life guards. Then she suddenly said there was a man having a fit or something and the life guard rushed over. The man had apparently been swimming and got dressed again but had ‘gone into aftershock’ as the rubber-hatted woman put it. She was clearly the expert. Several life guards gathered to make sure he was okay. He was laid down and wrapped in blankets. The woman was saying she was used to it and if you’re not used to it like him you should be careful and it was a shame her husband wasn’t here 'because he’s a doctor'. I wondered if I would go into aftershock. I voiced this to her. She asked was I used to it. I told her about the tarn and the unheated pool in five weeks in the winter that I braved. She thought twenty minutes would be enough. I stayed in half an hour and did a walking tour of the children’s section and around the wedding cake style fountain. The pool had a view of the town and moor above it. Stunning location. I then reluctantly left the pool, had a piping hot shower in the perfectly fine changing rooms and an awful cup of tea in the café, took some photos and headed back into the town. Not in aftershock. I am hardy. And well upholstered. Ilkley is a fine place, full of Saturday bustle. There seemed to be a lots of posh shops, 'interiors' ones in particular. The Veggie café I’d found online was full and I booked a table to return to in half an hour. I then walked round, got accosted by a charity woman, had a long conversation about mental health with her. She also told me where the charity shops were. I then had a great lunch and headed for them. I walked through the amazing market. Most stalls were full of food. Shame I was so stuffed from lunch. You could have a feast in Ilkley market and take a load of bread, tarts, nuts and jams back home. 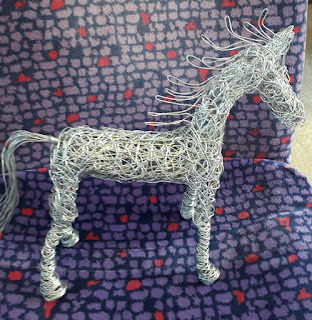 I succumbed at the African arts stall and bought this silver horse crafted from wire. Couldn't resist. I love the movement in the mane and tail. This horse is standing on beach, leaning into the breeze coming in off the sea. 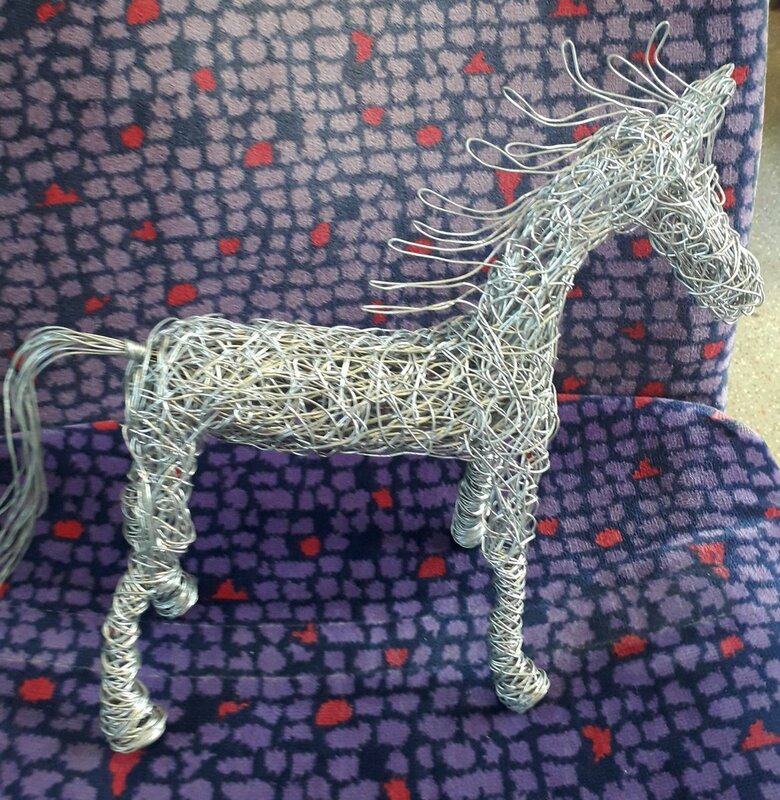 I do like horses. HORSES, Andy ... NOT slugs. Big difference. Photos of horses = good. Photos of slugs = yuck! 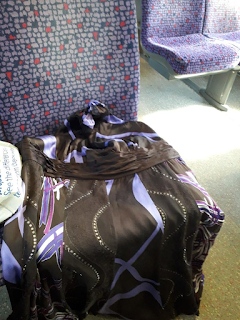 In the charity shops I bought several items, including a Monsoon dress for £8.99. It’s a very fitted size 20 with a halter neck (ridiculous!) & little zip at the side which doesn’t do up. I need to lose a bit more midriff. A few inches. Ok, four. I know I said I wouldn’t buy any more clothes that don’t fit but it’s in such good condition and close to fitting. And it was the Heart Foundation Shop, which I always like to support, 'cos of my niece's heart transplant. I gave them a tenner. I would anyway, regardless of the dress. It would be amazing to put it on and zip it up some day though. Worth swimming a million-trillion lengths for. But not worth giving up crisps and cheese. IF IF IF IF I am losing another 2-3 stone then I’ll be wearing that … er … somewhere. For hoovering the stairs or doing the washing up or strolling to the Londis, perhaps. But … onwards … #TheImpossibleThing I will get ya! But I WILL be treating myself along the way. The journey home was eventful. To cut a long story short, I saw how wonderful our paramedics are when a young woman had a fit on the train. (Two fits in one day? Was that my fault and will there be a third?) They were so good and calm and capable and so beautifully diffused the situation with her 'boyfriend' (he had upset her in some way which wasn't helping her, I reckon) insisting on not being ‘thrown off the train’ as he put it & then swearing and threatening to set fire to it. (He was smoking in the toilets when she had the fit). The big bearded older tattooed paramedic worked as a great team with the smaller younger female one, in saying and doing exactly the right thing. When the 'boy' got angry he spoke to the now slightly recovered woman and the other paramedic talked calmly to the belligerent 'boy'. Part of their training, I sensed. Basically, they were brilliant. As was the train manager. Give 'em all a pay rise, just like our politicians get. But still, it was a good day. I’m taking one day’s holiday tomorrow. 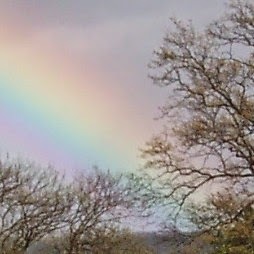 Off to Blundellsands and Crosby for beach walking & to finally see Another Place. More multiple trains and hopefully another nice lunch. And, fingers crossed, no one having a fit. No dramas please, but maybe a bit more excitement, adventure and really wild things.